Dumbbell biceps curls will tone up the front of your upper arms. 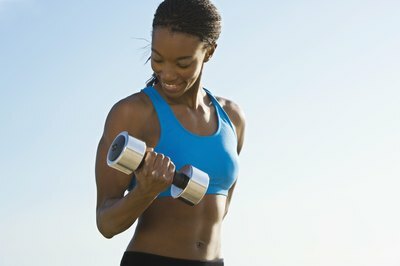 Tighten up your flabby arms with a pair of dumbbells and some discipline. To thoroughly target all of the muscles in your upper arms, address your shoulders, biceps and triceps. With a pair of dumbbells, you can hit each of these muscle groups. Stick with the program for a couple months, and you’ll be happy with the noticeable differences in your arms. Schedule your workout two days per week with two days of rest in between. Your muscles need time to rest and recover. Perform three sets of eight to 10 repetitions of each assigned exercise. This type of workout volume is designed to increase muscular tone. Rest about 60 seconds in between your sets. Choose a dumbbell weight that causes your muscles to feel tired at the end of each set. 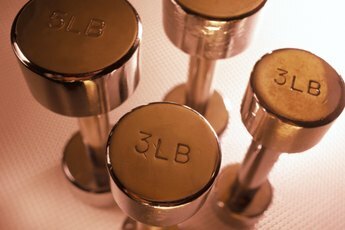 If you struggle to reach eight repetitions, lighten up the weight. If you can do more than 10 without any problem, use a heavier weight. Incorporate shoulder presses into your workout to target your shoulders and triceps. Stand and hold the dumbbells at your shoulders with your palms facing forward and your elbows lined up directly under your wrists. Push the dumbbells up over your head until your arms are straight and then lower the weights back down to your shoulders. Assign lateral raise into each session. Dumbbell lateral raise isolates your shoulders. Stand and hold the weights down by your sides. Lift your arms up and out to your sides until your arms are parallel with the floor and then lower your arms back down. Perform dumbbell biceps curls to hit your biceps muscle. Hold the weights down by your sides with your palms facing forward. Bend your elbows to bring the weights up to your shoulders. Schedule concentration curls in each workout so you can concentrate on one biceps muscle at a time. Sit on the edge of a bench and lean forward at the waist. Hold a single dumbbell in one hand. Place that arm’s elbow against your inner thigh so that your forearm is perpendicular with your leg. Start with your elbow extended so that the weight’s resting down toward the floor. Bend your elbow to bring the weight up towards your shoulder. After you’re done with the set on one arm, switch sides. Assign lying dumbbell triceps extension to isolate the triceps at the back of your upper arms. Lie on your back on a bench and hold a dumbbell in each hand with arms full extended over your chest and palms facing together. Bend your elbows to lower the dumbbells down by each side of your face. Don't use a weight that's too heavy, as it can cause you to use improper form. You don't want to have to jerk to complete biceps curls or dip down to build momentum to push the weights over your head in shoulder press. Visit your doctor prior to starting any exercise program. Find a partner to spot you when you're doing the exercises that force you to hold weights over your head, such as shoulder press and lying triceps extension. Kim Nunley has been screenwriting and working as an online health and fitness writer since 2005. She’s had multiple short screenplays produced and her feature scripts have placed at the Austin Film Festival. Prior to writing full-time, she worked as a strength coach, athletic coach and college instructor. She holds a master's degree in kinesiology from California State University, Fullerton. 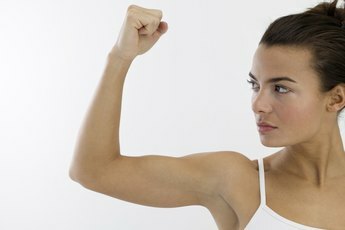 What Exercises Can Women Do to Bulk Up? Can Lifting Dumbbells Make Your Chest Bigger? What Dumbbell Workouts Make Your Wrists & Forearms Stronger? What Exercise Will Work All Parts of the Arm?